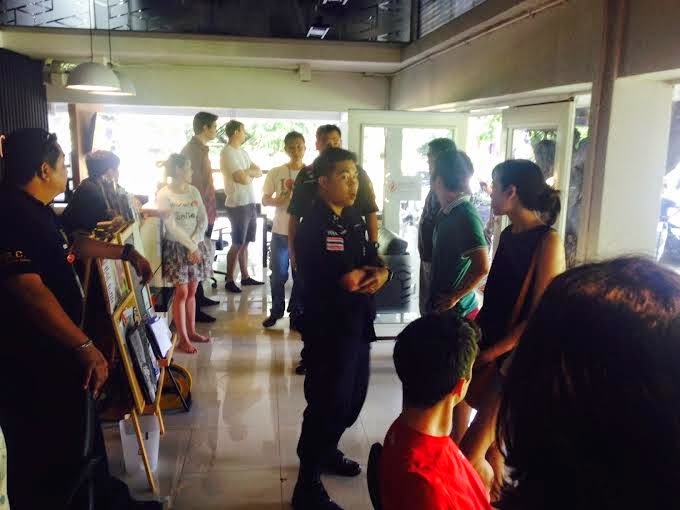 Armed officers raid PunSpace, a popular ‘co-working’ space in Chiang Mai. People on tourist and ED visas targeted. CHIANG MAI:-- Up to 20 armed uniformed police and immigration officials raided a popular co-working space in Chiang Mai earlier today in an apparent crackdown on foreign nationals working illegally in the city. The raid resulted in 18 foreign tourists being being taken away in a police van to the immigration office at Chiang Mai airport. According to a source who was at PunSpace during the time of the raid, immigration officials informed everyone inside that they would detain those who could not produce their passport or prove their identity. PunSpace, which is located on Sirimangkalajarn Lane, in the Nimman area of the city, is a shared office space which according to its website is a lively co-working space which “offers peaceful and creative working environment” and is regularly used by web developers, online marketers, bloggers, writers and graphic designers. This latest news seems to indicate a change of policy by Chiang Mai immigration with regards to Digital Nomads, or those working online. Just over a month ago, the Chiang Mai Mail reported that online workers are not prohibited from working without the valid Non-B documentation and work permit. Following this news, Thaivisa.com has tried to contact PunSpace but no one was available for comment. Another pathetic and pointless immigration raid. Interesting to see how this pans out, if they are all released without charge it's quite a validation of the initial reported comments from the Chiang Mai Immigration official regarding it being fine to work remotely so long as the clients were not Thai and payment was not to Thailand. As another poster pointed out on another thread, at the time a TV member who attended the meeting claimed the report was a misinterpretation / embellished version - I think the outcome of this event is really important in terms of validating or retracting the previous reported remarks. In reading the full blog posting, it seems that everyone who could produce a passport with a valid visa or current visa-exempt status was left alone. And perhaps a misunderstanding that the people were working (employed by) PunSpace. So, I wonder if it's really an exercise in harassing digital nomads, or just an opportunity to check visa status for a group of foreigners who are congregated together. I wonder what's next? Will they storm the next Expats Ladies Lunch and ask to see that we all have our passports with valid retirement visas? I now carry my passport with me at all times. Yeah, I know it's a hassle. I put it in a plastic bag and hopefully it won't get stolen or trashed out. They need armed police to check passports? if just authorities were so effective with real criminals! The problem here is that there isn't really a visa class for 'digital nomads' or whatever it is you want to call them. As far as immigration is concerned, these people are just the same as Burmese labourers, Russian tour guides or non degree holder English teachers working without a work permit. Also, going to 'work' in a co-working space is asking for trouble as none of these foreigners will have work permits or Non-B's because they aren't working for a Thai organisation. If you were 'working' under the radar, so to speak, why make yourself a target by going to such a venue? Look on Twitter and you'll find loads of these self proclaimed digital nomads and online entruprenurs talking openly about 'working' in Thailand. Then in the next post they're complaining about having to renew their ED-Visa!! It's stupid, all Immigration would have to do is check Twitter and they could easily identify many of these people working illegally. What Thailand needs to do is update its visa laws and welcome digital nomads - but don't hold your breath that will ever happen! These are all people that the only thing they do here is SPEND MONEY they have nothing to do with working in Thailand or taking away from any Thai person so the only thig they do is add to the economy of Thailand by spending their money here. I dont think this is a crackdown on online workers I think it is a misunderstanding that they thought they were all employed by Punspace. however if they did say that Digital Nomads cannot work it makes no difference to these people because what they do they can do anywhere and will most likely move onto a place that welcomes them and that gives them a SENSIBLE option to get legal instead of a work permit that required a company funded by 2 Million baht plus having toemply 4 thais before a work permit is qualified for a foreigner. Its actually good this happened because now we will see clearly what the stance is and so far looks like there is not an issue with Digital Nomads working online.but we will see as they are all released. I have almost given up to comment on these kind of posts - by now it is obvious that Thailand is addicted to self destruction. I think this is mis-interpreted. More likely as one poster said above it may have been an opportunity to do a routine visa check for overstayers as opposed to WP issues. Or I wonder if Pun Space has a business competitor who just wanted to cause a little mischief? This is the latest incident in the long running controversy regarding the question: do foreigners have to carry their passports with them at all times? It would be nice to know whether or not a law exists that says so.